Keeping in mind the diverse requirements of the clients, we are engaged in offering Antiseptics & Disinfectants. We are the leading organization in the industry to provide our clients the best grade of Peracetic Acid & Hydrogen Peroxide Disinfectant Liquid. 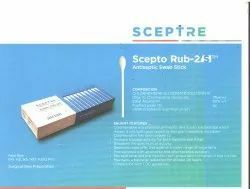 This range is an effective sterilant formulated for use after dilution for many applications like high purity water systems, medical and laboratory equipment. It is mostly used in Dialyzer Reprocessing System. Using optimum grade chemical compounds and advanced processing technology, this range is processed by our adroit professionals. We offer this acid in numerous packaging options according to the requirements of our clients. 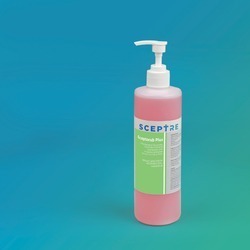 Peracetic Acid & Hydrogen Peroxide Disinfectant Liquid is an effective sterilant formulated for use after dilution for many applications, for example, high purity water systems, medical and laboratory equipment. It is mostly used in Dialyzer Reprocessing System. Purified Water I.P : q.s. With the continuous support and sincere efforts put by our experienced professionals, we have been able to provide our clients a qualitative grade of Disinfection Decalcification and Descaling. This chemical is effectively used in bio-film, calcium, magnesium deposits to reduce Hemodialysis Machine breakdown. This chemical is well-processed by our skilful professionals using optimum quality chemical compounds and innovative processing techniques. Our offered chemical is highly acknowledged among our clients for its exact composition and long shelf life. This is used for descaling & decalcification of haemodialysis machines with recirculation. We are a unique entity in the market, actively committed towards offering an optimum grade of Hand Rub (Chlorhexidine Gluconate Solution). In compliance with set market standards, our offered range is perfectly processed by dexterous workforce using premium grade chemical compounds and modern processing techniques. Furthermore, our quality inspectors test this range against diverse parameters of quality to avoid any kind of impurity. We offer this range in accurate composition within stipulated time frame. We are among the reputed organizations, highly engaged in providing a premium grade of Chlorhexidine Gluconate & Ethyl Alcohol Solution. 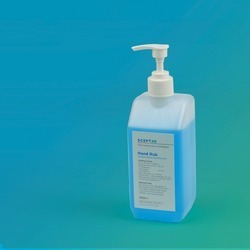 This range offering rapid skin disinfection, easily mounted in point-of-care and public areas. This range is highly acknowledged among our patrons owing to its proper cleaning and long shelf life. According to the set industry standards, the provided range is processed by our diligent professionals using superior quality chemical compounds and contemporary processing techniques. 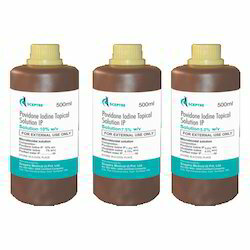 We are providing our valuable clients an exclusive grade of quality assured Povidone Iodine Topical Solution IP. The provided solution is available in diverse packaging options as per the needs of our patrons. This solution is precisely processed using premium grade chemical compounds with the help of advanced processing techniques. Owing to its high solubility and long shelf life, this solution is widely admired among our clients. Apart from this, our respected clients can purchase this solution from us at market leading prices. Medical/ surgical instruments,can be used for manual, automed or ultrasonic cleaning. GUARD 360 - Hydrogen peroxide -27% - one stop soltution for disinfection of instrument, air surface. features : eco-friendly, biodegradable and rapid disinfectant. h2o2 leaves no traces of element. Non - toxic, non-irriatating long lasting disinfectant. Highly effective against biofim. hospital -ot,icu, wards , diagnostic, labs clinic. Being a leader in the market, we are engaged in providing our clients the best grade of Isopropyl Rubbing Alcohol. The provided alcohol is used primarily as a topical antiseptic. At our production unit, this alcohol is processed under the direction of our deft professionals using supreme grade chemical compounds and pioneered processing techniques. Owing to its long shelf life, the offered alcohol is broadly acknowledged among our patrons. We are instrumental in offering a qualitative grade of Chlorhexidine Gluconate Cetrimide and Propyl Alcohol Concentrated Solution to our clients. Our offered chemical also cleans the affected areas off their bio-burden or organic material. In sync with the defined industry standards, this chemical is perfectly processed by our adroit workforce using modern processing techniques. Owing to its accurate composition and effectiveness, this chemical is highly appreciated by our clients. Moreover, to ensure its quality, this chemical is strictly examined by quality controllers against various quality measures. Backed by rich industry experience, we are highly engaged in offering a qualitative grade of Hydrogen Peroxide. 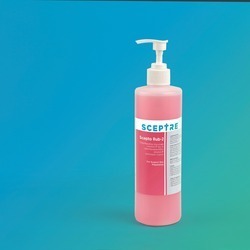 This solution is a mild antiseptic used on the skin to prevent infection of minor cuts, scrapes, and burns. This solution is processed under the surveillance of our experienced professionals making use of quality assured chemical compounds and modern processing techniques. Furthermore, our patrons can avail this solution in various packaging options as per their needs. 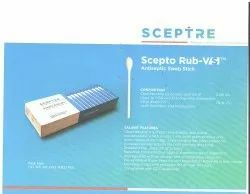 With enriched industrial experience and knowledge, we are providing a qualitative grade of Sceptocleen-AF. The offered chemical is widely used in pharmaceutical industry. This chemical is processed by our experienced professionals using superior grade chemical compounds and contemporary processing methodology at our production unit. The provided chemical is thoroughly checked by quality experts on diverse parameters of quality in adherence to set industry standards. Our clients can avail this chemical in safe packaging at a reasonable price. 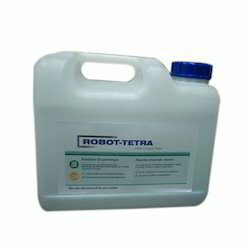 We are the leading supplier to provide our prestigious clients an optimum quality grade of Robot Tetra Cleaner. Our offered cleaner is an efficient cleaning agent and sterilant. This cleaner is precisely processed under the supervision of our experienced professionals using premium grade chemical compounds and cutting-edge processing technology. We provide this cleaner in numerous sizes packaging options according to the various demands of our respected patrons. Furthermore, this cleaner can be availed by our clients at a reasonable price. 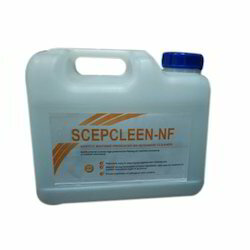 We offer our precious clients the premium grade of Scepcleen NF Disinfectant. Our offered chemical is widely used for treatment of suitable instruments made of aluminum. In synchronization with the predefined industry standards, this chemical is well processed under the direction of our skilled professionals using quality assured chemical compounds and ultra-modern processing technology. The provided chemical is broadly demanded for its remarkable features such as accurate composition and high effectiveness.